This is an archive of all previous updates. The CURRENT update is on the index page. You can view updates from the past 2 1/2 years - 5 September 1998 through 4 March 2001 here. UPDATE 10 NOVEMBER 2001: Hi! The Vic Merchandise section has been updated so that you can easily order Vic's movies. Each time you re-load the page it will show you different Vic movies that you can buy. The Links section has been updated. The four links on top are new and I fixed all of the old links that didn't work anymore. The Archive is updated. Remember to check out TV-Now's NOVEMBER schedule to keep up-to-date on which Vic movies will be on. UPDATE 12 OCTOBER 2001: Hi! Two articles with great photos have been added to Vintage Victor 2 - Vic Relaxing 1940s and Vigorous Victor 1940s. UPDATE 30 SEPTEMBER 2001: Hi! Since the last update the Poll question has been changed. Please remember to vote in the poll. :) A new Victor Mature Chat Room has been added. Now you can chat with other Vic fans about his movies! I've moved the Current Update Information from the Index page to the Update Page. I will be able to update more frequently now because I don't have to keep changing the main page. Always make sure to check the UPDATE page for all current changes to the site! Please remember to check out TV NOW's Victor Mature Schedule for OCTOBER that is up now! UPDATE 2 SEPTEMBER 2001: Hi! Since the last update two articles with pictures have been added to Vintage Victor 2 - Handsome Vic 4 Years Before His First Movie Role and Candid Vic and Lana. Enter this CONTEST to win a copy of One Million B.C.! Happy 3 Year Anniversary of the Victor Mature Fan Club! Updates is current. Remember Fred Carson who sadly passed away on 31 July 2001. :-( Please remember to check out TV NOW's Victor Mature Schedule for SEPTEMBER that is up now. UPDATE 3 AUGUST 2001: Hi! Since the last update three galleries have been added to the New Gallery. Special thanks goes to Robert Klimowski for Gallery 55 and 56! Thank you to Lucy for Gallery 57! Make sure to check out and buy a NEW NOVEL about Hollywood during the WWII years by Charles Rubin. Thank you to Mr. Rubin for the information. Enter this CONTEST to win a copy of One Million B.C.! Visit the Exhibition and Cinema Review Section which was recently updated. Thank you so much to Mr. Benedetti for the photos! August 4th will mark two years since Victor passed away. :-( Remember him by watching your favorite Vic movie on that day. Updates is current. Please remember to check out TV NOW's Victor Mature Schedule for AUGUST that is up now! UPDATE 9 JULY 2001: Hi! The Exhibition and Cinema Review Section has been updated with some great new info and photographs. Thank you so much to Mr. Benedetti for the photos! For the 27 JUNE 2001 update four new articles with photos were added to Vintage Victor 2 - Vic And Jane Russell From "The Las Vegas Story", A Rare Scene That Was Edited Out Of "Kiss Of Death", Vic And Lana Turner From "Betrayed", and Various Scenes In Vic's Career. Updates is current. Please remember to check out TV NOW's Victor Mature Schedule for JUNE/JULY that is up now! UPDATE 5 JUNE 2001: Hi! For this mini-update two articles have been added to Vintage Victor 2 - Vic's Gifts To His Customers and Victor Begins His Career. Updates is current. Please remember to check out TV NOW's Victor Mature Schedule for JUNE that is up now! UPDATE 4 MAY 2001: Hi! I am currently working on updating almost every section of the website so this is a mini-update. :) Since the last update a new Poll question has been added. The Archive has been updated. Updates is current. Before you leave the site please visit Biography and e-mail them a request to do a segment on Victor. Just click on PROGRAMMING when you get there and then on BIOGRAPHY SUGGESTION and let them know that you want to see a Biography on Victor Mature! :) (Thank you to Dixie. 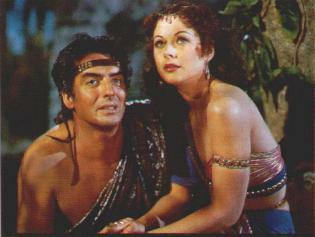 :) Please remember to check out TV NOW's Victor Mature Schedule for MAY that is up now! UPDATE 9 APRIL 2001: Since the last update 3 new articles with great pictures, Victor Thanks God And Gilmor Brown Of The Pasadena Playhouse For His Career, Victor Retires From Showbusiness at 45, More Of Handsome Vic Pictures, have been added to Vintage Victor 2. You can now buy copies of the videos for "Bandit of Zhobe" and "Tank Force" on PAL plus more! :) Updates is current. Please remember to check out TV NOW's Victor Mature Schedule for APRIL that is up now!